The Archbishop of Canterbury, Justin Welby, is suffering from pneumonia, it was announced the day after he was forced to forgo preaching at the annual Canterbury Cathedral Christmas service. Lambeth Palace, the archbishop's residence, tweeted: "Just to confirm the archbishop of Canterbury @JustinWelby has pneumonia & is resting at home. Thanks for all your prayers & good wishes," the Press Association reported. On Christmas Day Lambeth Palace had posted a message on its website saying, "The Archbishop had been due to deliver an address on the true spirit of Christmas but cancelled on Thursday morning as he was too unwell." The Dean of Canterbury, Rev. Robert Willis, delivered a homily in Welby's place while the text of the Archbishop's planned address was published online. 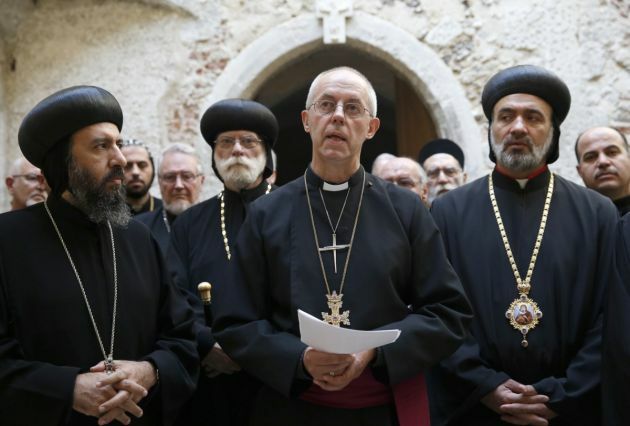 The Archbishop of Canterbury is the spiritual leader of the Church of England and considered the most senior bishop in the 80 million-strong worldwide Anglican Communion. Welby returned last week from a trip to Ebola-stricken Sierra Leone in West Africa. The announcement that he has pneumonia allayed, "fears that he had contracted Ebola in Sierra Leone," The Telegraph newspaper reported on December 26. Welby's spokesman said he would need "bed rest for a few days," the newspaper reported. In his published sermon Welby referred to the much publicised very temporary truce during World War I on Christmas Day in which British and German soldiers played soccer with one another. "At Christmas 1914 soldiers took the risk, crossed a battle-line and kindled an evening of friendship and football. It is the moment all have picked on this year, whether in adverts or sermons," the Archbishop said. "Of course we like Christmas stories with happy endings: singing carols, swapping photos, shaking hands, sharing chocolate, but the following day the war continued with the same severity. Nothing had changed; it was a one-day wonder. That is not the world in which we live - truces are rare." Turing to Sierra Leone, Welby said disease does not have truces. "Last week I saw a young woman named Monica near Freetown [in Sierra Leone], teaching a group of Ebola orphans to sing about Jesus building community," he wrote. "Her face, her manner, her pragmatic Christ-likeness is before me in my mind as I remember. "That is the impact of the baby in the manger, the impact of the one who reaches out to us and brings not a day-long truce but permanent peace with God, not escapism but to a call to be those who change the world in which we live."